The Mark Five Bomb, courtesy Wikipedia. The Mark Five was one of the first mass-produced atomic bombs. There’s a model of it on display at the National Museum of Atomic Science and History in Albuquerque . The museum is the AEC’s attic, full of old bombs. It gave me a start to find it in the back of the display area, this huge pumpkin bomb with its two cute little doors on the front, and sitting next to it was the so-called “bird cage” container that held its plutonium core element. I had to remind myself that it was 2010, not l959. The bomb on display was probably a dummy that bomb-loaders practiced with. 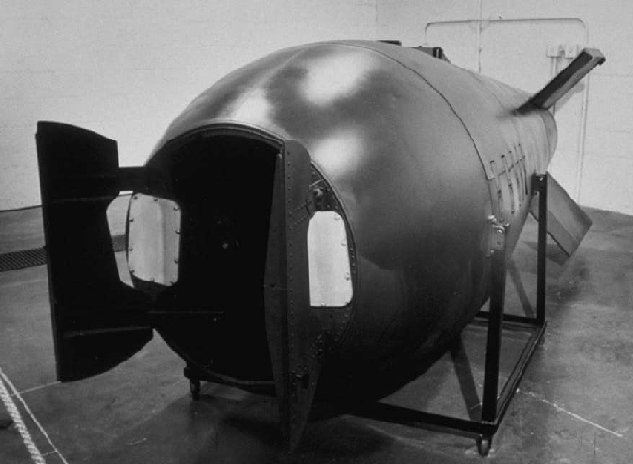 The doors on the front of the bomb weren’t going to swing open like they did in the arming sequence, and the In Flight Insertion (IFI) wasn’t going to come out to bite us. The day they retired the Fives from the stockpile was a wonderful day for the world. It was a direct descendent of the “Fat Man” bomb dropped on Nagasaki. The Mark Five was armed in flight, by the pilot. On the landing strip a thin-walled stainless canister holding the plutonium sphere. a TNT shaped charge and a detonator would have been loaded into its tray inside the nose of the bomb; Up in the cockpit, on his final run into the target the pilot would flip a couple switches. Down in the bomb bay there would be a growling of electric motors. Motors would bring the tray from vertical to horizontal, the doors would open as it came up to insertion position. Then its load would be rammed down this tunnel, the doors closing behind it. Another light would come on when it was seated. The bomb was now armed, the nuclear seed was now in the center of the sphere of the implosion sphere. The whole process took about a minute. Wham, wham, a high speed scary operation. One of these old bombs might have exploded on my best friend Abe if he hadn’t organized a revolt in his assembly crew. Abe and I were the intellectuals of the barracks. While everyone was gone on liberty, we’d sit there with our books, saving our money. Picture an amiable son of a Montana farmer with a big drooping moustache, perched on his bed reading science fiction. One night they pulled a “red alert” exercise. Liberty was cancelled, they locked down the base, put Marines up the guard-towers, and the sirens wailed. World War III was presumably underway: we were bused to our underground bunkers. A nonstop rush in our assembly areas would be organized, maneuvering bombs and warheads to get them to the airstrip where they were loaded on B-52s and C-130s. The newest weapons with quick turn around times were shipped first; gradually as the night turned into day you began to see the older bombs in the stockpile coming out. About four AM, a Mark Five was rolled into the assembly bay. The minute you saw these big old olive drab monsters coming in you knew it was a training exercise and not World War Three. They said this kind of exercise sharpened your skills. We knew even though we might bust our tails to get it to the airstrip at 0600 hours, the weapon would never be maneuvered and would come back to you a couple days later with orders to disassemble it and put it back in storage. But Ski, the boss of Abe’s assembly crew, wanted to get back in the good graces of the base commander and meet the impossible convoy deadline. In the late fifties there were tensions between the old guard and the new guys trained in Albuquerque. The old guard was still in charge of weapon assembly teams, most of them gunner mates and electricians trained in the field. The new guys like Abe ran things by the book. What the good book said was that if you installed a new IFI, you ran it by hand with a spanner, taking it nice and slow, measuring the clearances. The charge, under power, ran through its cycle at high speed, and if you had a jam, you could have an accidental detonation. This bomb came in with the doors jammed halfway open, the IFI mechanism peeking shyly out. Someone had tried to arm it, but it had jammed. There was a big red tag on it. Do not use had said someone in the fleet six months earlier. Ski was hung over and in a bad mood. I think the Marines had rousted him out of a barroom. So, to make a long story short, after the new IFI was in place, and the old one was in pieces on the floor, the crew took a break. They came back to find Ski had jumped a couple pages ahead, and was ready to run it on power. A hell of an argument broke out. Abe told me that he had his hand on a big wrench and was thinking seriously of nailing him with it. A lot of threats were flying, but nothing was being done. It was a stalemate. The crew ran for it, exiting through the blast doors and running for a nearby pickup. They were just pulling away when Ski came out behind them waving his hands. There was about 1,000 pounds of TNT in that bomb, and the shock wave from the five probably would have triggered all the TNT in neighboring weapons, and we all would have all been dead in a terrifically dirty conventional or low-grade nuclear explosion. It was a scary era. We were in an arms race with ourselves, and with the world. We were starting to mass-produce thousands of smaller and lighter bombs, bombs that could be hung on the wings of Navy aircraft, used for atomic mines, put on the nose of IRBMs, even deployed as battlefield weapons. In the explosive environment of the cold war, both Russia and the U.S. were struggling to gain nuclear supremacy. Edward Teller at Livermore Laboratories had a lot of influence in Washington; he was one of the key people in our weapons program. In 1958 there are two weapons laboratories, Lawrence Livermore at the University of California, and Los Alamos, run by Norris Bradbury, the legendary “old man” of the Manhattan Project who held the lab together after the end of World War Two, when the great majority of the scientists left Los Alamos to return to the academic community and peacetime work. Bill Ogle’s book about nuclear testing opens in the 1957-58 period, when it seemed that President Eisenhower was going to approve a one-year moratorium on atomic testing. Bradbury didn’t think it would be such a bad idea. Teller and his allies in the Air Force and Congress fought it tooth and nail. Teller was a brilliant,very determined man, a Hungarian born physicist, someone who was probably the model for Doctor Strangelove in Stanley Kubrick’s satiric movie about the buildup to World War III. In his fight to develop the hydrogen bomb, he found many conservative allies in the Congress. He considered E. Robert Oppenheimer, the first director of the Los Alamos National Laboratory, a security risk. His struggle to discredit him turned into a witch-hunt that divided the scientific community and destroyed Oppenheimer’s career. He also was an influential figure in killing President Eisenhower’s attempt to get a comprehensive test ban by sowing doubts about the feasibility of seismic detection of underground atomic tests. His ability to influence decision makers with his theoretical projections was phenomenal. He showed that it was theoretically possible to muffle the seismic signals by setting off bombs in great cavities deep under the earth so as to cheat on any detection system. This set off a dubious “big hole scare” that British Prime Minister Harold MacMillan said was a major factor in killing off negotiations for a test ban treaty. The trust agreement permitted the U.S. to close off the Marshall Islands for security reasons. The weapon testing area was known as the Pacific Proving Grounds. After reaching an accord with the people of Enewetak (the original spelling) and relocating them, the U.S. used Enewetak for nuclear weapon testing in 1948, 1951, and 1952, culminating with the 1954 Castle series. The first shot of the Castle series produced such extensive radioactive fallout that a third Marshallese group, the Rongelapese, was evacuated from its contaminated home island and relocated for several years. The natives of the Marshall Islands were coming down with radiogenic diseases. The United Nations had seceded control of the territories to the U.S, but were talking about taking it back. The fallout from these hydrogen bombs stiffened the resolve of the world. The great megaton-level blasts vaporized whole islands. It was the Sputnik area. The country was scared by the first Soviet space satellite, “Sputnik I,” launched on October 4, 1957. If Russia could launch a satellite, they could launch an ICBM. Then there was Sputnik II, with a heavier payload. Both Russia and the United States began talking wishfully about multi-megaton space weapons that would intercept and neutralize incoming ICBMs. After the disastrous Castle Bravo shot the Marshall islanders petitioned the United Nations to stop the nuclear testing in their territory or, if the testing was essential, to exercise all precautions to safeguard the inhabitants and their possessions. The U.S. continued to test at Bikini and Enewetak in 1954, 1956, and 1958. The people of the United States were increasingly concerned about fallout, but not the government. 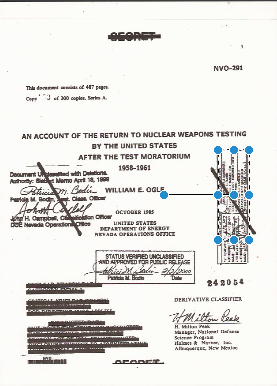 “It appears,” grumbled Ogle, “that not a single person in the whole chain of decision makers at that time, all the way to the President through the President’s Science Advisory Committee, the Strategic Air Command, the Los Alamos National Laboratory, and the AFSWP(Armed Forces Special Weapons Project) actually believed that there was any serious hazard associated with worldwide fallout.” There was an air of blase indifference about the possibility of human casualties to radiation. To harden the troops against this new weapon, they would march soldiers and sailors out to the beaches, sit them in ranks with their backs turned to the blasts. There were atrocities in Australia when Great Britain was atomic testing, and unprotected British soldiers and aborigines were the victims. Only on the Internet can you see the videos of the early days of the atomic age. There is one video on U-Tube (Australian Atomic Confessions) that I can’t watch. It is too awful. There was the same barbarity on Eniwetok, when winning the arms race justified U.S. soldiers summarily evicting the 200 dri-Eniwetak natives from their relatively large atoll (2.75 acres), and put them on tiny Ujelang (.75 acres), where they suffered in overcrowded semi-starvation conditions for many years. Only after CBS News televised their plight in 1970, did they get their island back.